I read the Bible most days, but most days, I’m not a morning person. I usually open it up right before I’m going to bed and scan through a few verses. It’s cathartic for me as it lets me re-center after a long day. Recently, though, I changed up my routine. I decided to make God the first part of my day. For the last month, every morning when I’ve woken up I’ve cracked open the good book. Instead of re-centering, I’m starting my day off centered. I don’t follow a structure or real plan when I read the Bible. In all honesty, I crack it open, shift around and land on whatever looks good for the moment or situation I’m in. Right now, I’m working through the book of Jeremiah. I’m not a theologen, so this is the best way I can sum up Jeremiah: God sends Jeremiah messages through visions. Jeremiah shares these messages with the Israelites. The bulk of these messages center around how God is angry that the Israelites are are choosing idols over Him. Time after time, God warns the Israelites of their pending doom for doing so through Jeremiah. Time after time, God tells the Israelites that they can save themselves from said doom if they would just turn from their idols and to Him. Time after time, the Israelites don’t. And time after time, they are destroyed. When I started reading Jeremiah, I almost quit. There was so much death and destruction. I couldn’t find hope in the book’s pages. I didn’t think any of it applied to me or ever could. For some reason, though, I kept turning through the pages. I kept waking up each morning to read it. I teach a class at the University of Miami on sports governance. Whether students recognize it or not, the bulk of the class is focused upon the point that in order to successfully govern anything, one must have a clear mission and vision. I’m a big believer of “practice what you preach.” So, this summer, I’ve spent a lot of time thinking about what my vision for my own life is. What vision do I have for how I govern my own life? It came to me this week. About a week into reading Jeremiah, I found a way to relate it to my life. As I sifted through the messages in it, my eyes were finally opened to something in my own life. I finally was honest with my heart and God, for that matter, about the one thing in my life I chase after that He so clearly doesn’t want me to. For me, that thing is a person. It’s a person that I’ve let my guard down around more than most. It’s a person who has seen my vulnerability. It’s a person that I’ve loved. It’s a person who has broke my heart time after time after time after time again. And it’s a person who, a few weeks ago, I almost let do it again. I wear my heart on my sleeve. If I like you, I will do anything for you. If I love you, I will go to the end of the Earth for you. My greatest attribute–and perhaps, flaw–is that I am loyal. It’s easy to get caught up in feelings and emotions. It’s easy to forget the past when someone is standing in front of you telling you all the right things as they look into your eyes. The hard thing, though, is to walk away. I knew I couldn’t go back. And so I prayed. And prayed. And prayed. For God to take the feelings I have for him out of my heart. To not let me feel. To help me move on. Because God and everyone else–including me, finally–knows that it’s well beyond time. I had a plan. And it all but centered around him. I would’ve dropped everything, quit everything, picked up and moved if he just said the words. I would’ve left behind a great job and my dreams to let him chase his. In my plan, I could see myself racing down to the hardwood as confetti fell from the ceiling after a championship was won. My plan saw us taking over the sports world, the king and queen, if you will. It seemed pretty glorious, this plan of mine. For a long time, I would never let myself believe that there could possibly be anything better than the plan I painted in my mind. 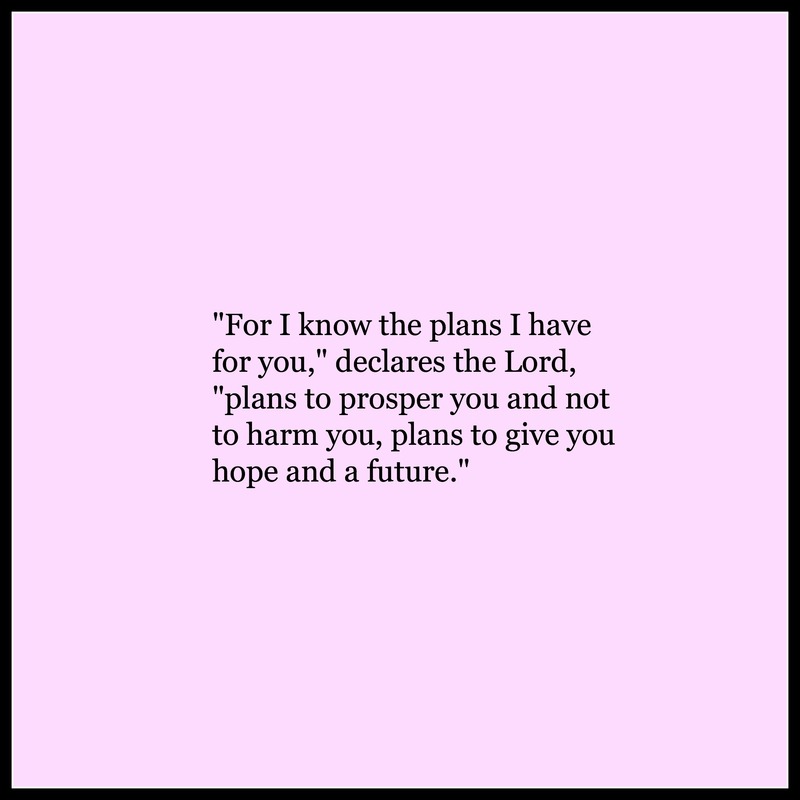 And I knew, that my plans were not His plans. I knew they weren’t His plans, because when I was honest with myself, every time I chased my plan, my heart was destroyed. It would be built up for a period of time with “I want you’s” and “Be with me’s” and “Let’s do this” only to be left shattered soon there after. Time after time after time after time. God’s plan isn’t one that destroys you. God’s plan isn’t one that makes you second-guess yourself or your dreams. God’s plan isn’t one that leaves you wondering if you’re making the right decision or doing the right thing. God’s plan is hope. It is a plan that leaves you with things better than anything any plan you conspired could’ve EVER given you. It is a plan that leads you down a road to eternity–a plan to give you a future. So I prayed. I prayed for God to take away MY plans. It was one of the rawest things I ever did. I laid in bed and over and over again said, “Please” and “I’m ready.” Let’s do this. And He did. For the first time in a long time, I felt nothing. Nothing. Do you know HOW LONG I’ve been waiting to feel nothing? If I were to have a vision for my life, it would be this: That when I look at it, I always see how faithful God has been to me. After I said that prayer, I got up and got on with my day. And as the day went on, it became more and more clear the path that is being set for me and the plans that are being made. It’s a path where I get to tell a story. It’s a path that allows me to tell my story, not only for me, but through others. On Thursday, three amazing opportunities came my way. All involve opportunities for me to partner with awesome companies to share both their and my story. They are things that I would’ve never imagined possible even a day before. That night, on my run I thanked God for helping shine a better light on the path I’m supposed to be traveling. My heart felt so open and grateful. For the first time in a long time, I felt completely free to pursue new opportunities. I felt completely free to chase after what I’ve come to realize is the plan for my life. I told Him that my life is His and that I trust Him with it. I asked him to take me where I need to go. When I looked up, I saw the most beautiful and brightest firework show lighting up the path in front of me. The lights twinkled over the water and for about 200 yards, it was just me running into a firework show that seemed to be lit up just for me. It was magical. As silly as it sounds, the spattering of fireworks across the Miami night sky confirmed the vision I have for my life. For as much as I have turned away from God and created my own plans, He has never turned on me. And I’ve learned, that He never will. Every time that I have turned back to him entirely, he has given me more than I ever could have imagined or dreamed for my life. And finally, I have come to understand what it means to be faithful. Thank you for sharing. It was a much needed read. FWIW – I was originally reading your article on Forbes.